Identification and purification of the FTS-1 complex by EMSA and DNA affinity chromatography. (A) Similar complexes form in EMSA with fibroblast nuclear protein and either 25-bp or 100-bp probes, both containing the FTS-1 core pentanucleotide. The complexes were challenged with nonlabeled probes. (B) Specificity of the FTS-1 complex established by EMSA following challenge by various nonlabeled competitors. 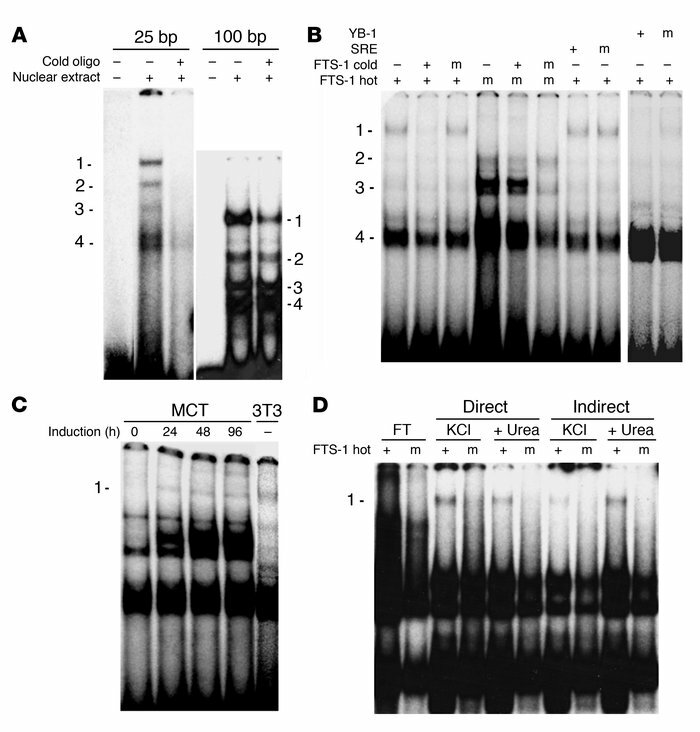 Fibroblast nuclear protein was incubated with the 25-bp radiolabeled FTS-1 or its mutant form (m). The complexes were challenged with DNA probes specific for different regulatory sites. The complex specific to the TTGAT pentanucleotide (marked 1) is at the top; (m) indicates the mutated oligonucleotides. (C) The FTS-1 complex (marked 1) is formed by MCT cells induced to EMT as evidenced by EMSA at different times after induction. A fibroblast-derived FTS-1 complex is shown as a positive control. (D) DNA affinity-purified proteins form only 1 complex with FTS-1 (marked 1) in EMSA. Fractions purified by the direct or indirect approach were eluted with 0.5 M KCl followed by 0.5 M KCl plus 5 M urea, dialyzed against 0.1 M KCl, and incubated with radiolabeled FTS-1 or its mutated form (m). The flow-through (FT) from the direct incubation could not form the FTS-1 complex.